One of the most valuable courses I took in graduate school, Professional Opera Coaching, required that you meet weekly with two coaches; one a vocal coach and the other an acting coach. The idea being that you would bring audition materials or roles that you were preparing and coach them in an environment focused on the individual. Coaches are trained to help you with specifics other than vocal technique (which is the domain of your voice teacher.) A good coach can help you clarify your opinion and artistic direction within the context of an aria or an entire role. For your day 28 challenge: invest in good vocal and dramatic coaches. To be clear, a vocal coach is not the same as your voice teacher. A voice teacher provides instruction on vocal production and technique. If you plan on working with both, it is polite to tell your voice teacher (or even ask for recommendations) with whom you will be coaching. A vocal coach will help you refine your understanding of the musical elements such as rhythm, dynamics, and style. Most vocal coaches are particularly adept at language pronunciation. Unlike some foreign language teachers or native speakers, they are keenly aware of the difference between spoken and sung language and help singers navigate the gray areas. Many coaches can also help singers develop good practice techniques and comprehensive role understanding. Be wary of anyone that simply accompanies the voice and does nothing to correct or further your musical understanding. Without that, the person is acting like something of a répétiteur – one who repeats and rehearses the music without further instruction. Your vocal coach is going to be a tenacious and unyielding watchdog for your communicative power. The point of visiting a vocal coach is to put your arias/roles under a microscope and acquire as much feedback as possible. This does not mean that you should expect your coach to spoon feed you all of the interpretation and style – you need to present the materials with opinions already formed. They will watch for “scooped” entrances or maligned portamenti or moments where you seem to be running on “auto-pilot.” Vocal coaches bring these many details to your attention so that you can become more prepared and secure in your vocal depiction of the character. 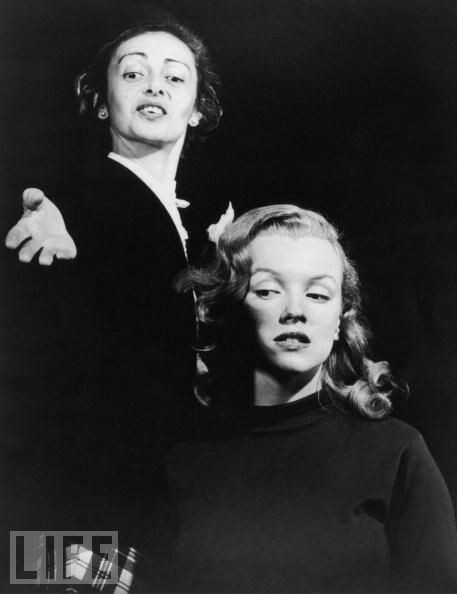 In 1949, while under contract at Columbia, Monroe studies under the studio's head drama coach, Natasha Lytess (left). Even after Monroe leaves Columbia, Lytess remains her acting coach for years. It is amazing how many singers believe themselves to be emoting while absolutely nothing is happening in their body or on their face. This is where the acting coach is a vital resource. This coach will be a sculptor of the dramatic and physical presentation of the musical material. A good acting coach will unquestionably help you stand out from the crowd. Although you will bring the dramatic groundwork and your original opinions to your sessions, a dramatic coach will facilitate a polished version of the intentions, tone, impressions, and spirit of the character. You should arrange to have an accompanist at your dramatic coachings and be prepared to be “off-book.” You have been working hard on your own practice time. Do not let incomplete preparation stand in the way of you absorbing as much feedback as possible. Before going in to coach (with both vocal and dramatic coaches, I might add), you should be able to provide a word-for-word translation within the score. The Nico Castel Opera Libretti Translation Series (published by Leyerle Publications, Geneseo, New York) are the epitome of diction/translations – providing both the IPA, word-for-word translation, and often adding idiomatic expressions. that I tell you to go spend, spend, spend your money. If you will, harken back to our Valentine’s Day post though when I told you to spend on what you love. Opera is an expensive business. You should get the most for putting in such an investment. One of the most specific ways to get better results is to coach with both vocal and dramatic coaches. Coaches will augment your singing team and provide even more insight and knowledge about the business. Be a smart cookie and get a return on your investment. Work with people who can give you the tools to succeed.